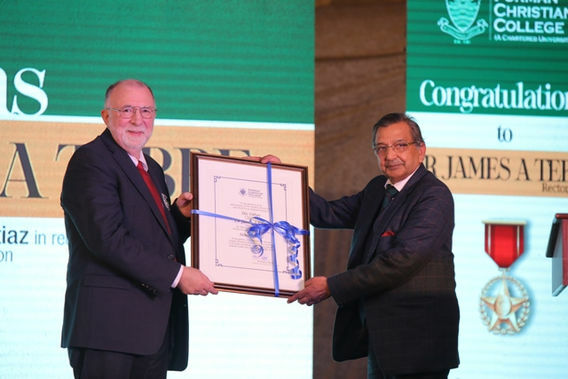 On Pakistan Day, March 23, 2019, the President of Pakistan, Arif Alvi, bestowed upon Dr. James Tebbe the Sitara-e-Imtiaz award for meritorious service to the nation. The name translates to “Star of Excellence” and is the third highest honor and civilian award given in the Islamic Republic of Pakistan. This recognition, similar to our Presidential Medal of Freedom, is awarded for "especially meritorious contribution to the security or national interests of Pakistan, world peace, cultural or other significant public endeavors". There were fourteen recipients of the Sitara-e-Imtiaz. Dr. Tebbe was one of only ten foreign nationals to receive recognition in the 124 total awards given this year. These prestigious awards are given only to those individuals who have made outstanding contributions in their respective fields. We have long known about Dr. Tebbe’s tireless work to bring to life the vision of Forman Christian College as a world-class liberal arts university where interfaith harmony is practiced, and with this award he was recognized nationally at the highest level for his work in education. We especially celebrate that Dr. Tebbe’s service at a historic Christian college is receiving affirming recognition in Muslim-majority Pakistan. This televised ceremony was followed up on March 28 with an on-campus event (pictured here) to celebrate Dr. Tebbe’s award. Honored guests spoke, including Dr. Peter J. David, FCC Board of Governors Chairman; Mr. Michael D. Guinan, Public Affairs Officer, U.S. Consulate General in Lahore; Dr. Hamid Saeed, Registrar, FCCU; Cheryl Burke, Chief Student Services Officer; and students, who gave thanks for Dr. Tebbe’s contributions. Dr. James Tebbe speaks at the award ceremony where he is presented with the Sitara-e-Imtiaz Award for meritorious service to the nation of Pakistan. Ms. Cheryl Burke speaks at the Sitara-e-Imtiaz award ceremony for Dr. James Tebbe. Congratulations to FCC's Dr. James Tebbe, recipient of the Sitara-e-Imtiaz Award!